From the University School Mediterrani we are very satisfied and grateful with the Escola del Treball for the two conferences that we have been able to do on Tuesday, February 14, framed within the XXIV Jornades Tècniques that this center organizes for many years, with the aim of give as much information to their students about the different career opportunities available to them. 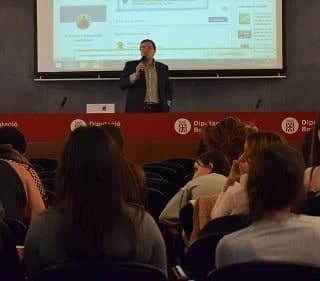 Joan V. Sagristà, Communication Director of EU Mediterrani has made two presentations, one in the morning and one in the afternoon with the title: “Options and exits in the degrees of Tourism and Marketing”. The participating students have been students of the Vocational Education & Training of Administration and Finances and also students of Secretariat, who have been able to clarify their doubts thanks also to the turns of questions that have taken place at the end of the presentations.